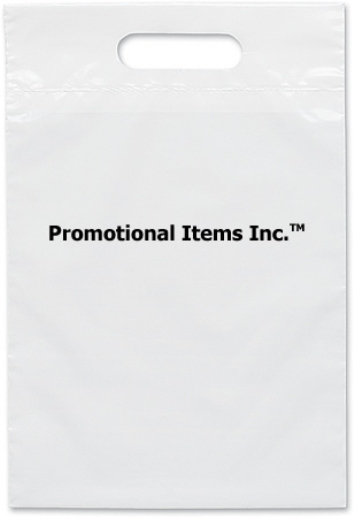 Small plastic bag that is economical yet large enough to hold full size 8 1/2" x 11" trade show information sheets. This promotional plastic bag is strong enough to hold numerous other items such as catalogs as well. The features are heavy weight 2.5 mil thicknesses, reinforced die cut handle. Four Day Production is std. for this product, orders of 3000 or less. You MUST order in whole increments of 500 units for this item. Overall size of the plastic bag is 9 1/2" w x 14" h.
The price includes a one std. color print on one side in an area 6" w x 8" h.
printed add $.17 each. No Extra Plate Charge for same design. $60.00 plate and a running charge of $.17 each bag. The second side print can be a different print color. Promotional plastic bags max one color per side. I must admit I was tempted to get the slightly smaller size bag, but opted for this one. Oh am I glad, plenty of room for my marketing sheets, my trade show notepads and pens. The PII description help me to make the decision, thank you for pointing out this on the product page. Also THANK YOU for getting them to me two days ahead of schedule. I will buy my trade show bags from PII next year too!